We have one little "thing" in our household... I like potatoes, and Regina, well, let's just say that she'd rather eat something else. So you could imagine my joy when Regina came back from a local farm market and handed me a sack containing a bunch of red potatoes. And yes, she was smiling. 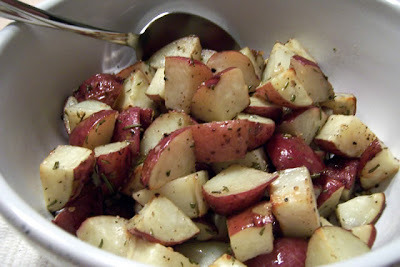 Here's my really simple-quick and dee-licious way to prepare them, even for a weeknight. And if you were wondering, these are "Regina-approved"... so I got that going for me... which is nice. 1. 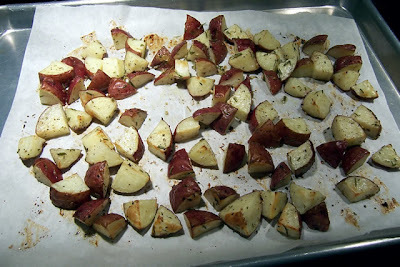 Preheat your oven to 400°F, and line a baking sheet with parchment paper (makes clean up that much easier... I said this was an "easy side." 2. 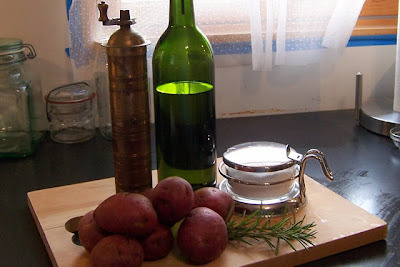 Wash and coarse dice the potatoes. There's a whole lotta flavor in those skins, so leave 'em on. 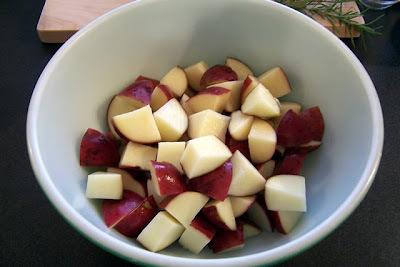 If you want to save time and dice the taters in advance, just be sure to store them in a bowl of cold water to prevent them from oxidizing, and be sure to drain them well before continuing. 3. 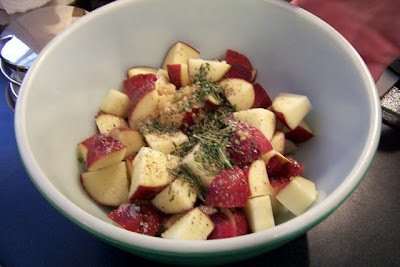 Add the drained potatoes to a mixing bowl. 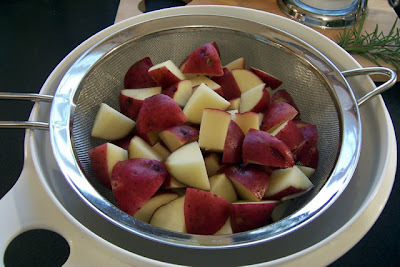 I LOVE red taters. 4. 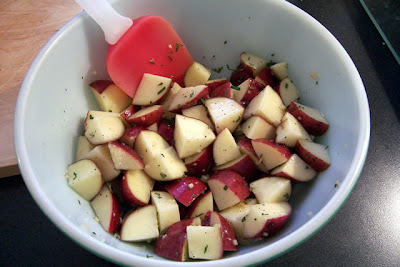 Add the rosemary, garlic, a few grinds of pepper, a few pinches of kosher salt, and then drizzle on about 1-2 Tbsp. of the olive oil. 6. 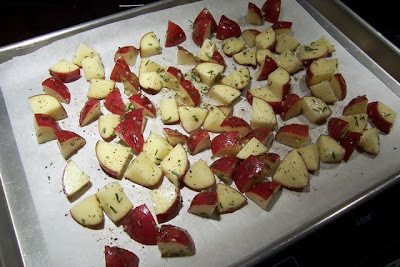 Spread the taters out onto the parchment-lined baking sheet, being sure to spread everything out to a single layer. I noticed that there just wasn't enough black pepper in it already, so I added just a bit more... and a bit more salt... and a bit of dried parsley. 7. Roast at 400°F for about 20-30 minutes, depending on your oven. We have a convection oven (swanky! ), so it only took about 20 minutes. 8. When done, move the hot taters to a serving bowl, and um, serve. These were so good, that I was thinking about making these up some Sunday morning (we can shift the waffles to dinner) and serving them with eggs and country sausage. Mmmm... tastygood. 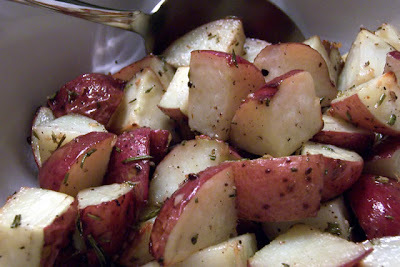 We had enough taters for two meals, so a few nights later, I traded the rosemary for dill and parsley and it came out great. Explore your herbs and spices, come up with a few variations of your own... just don't forget to share.